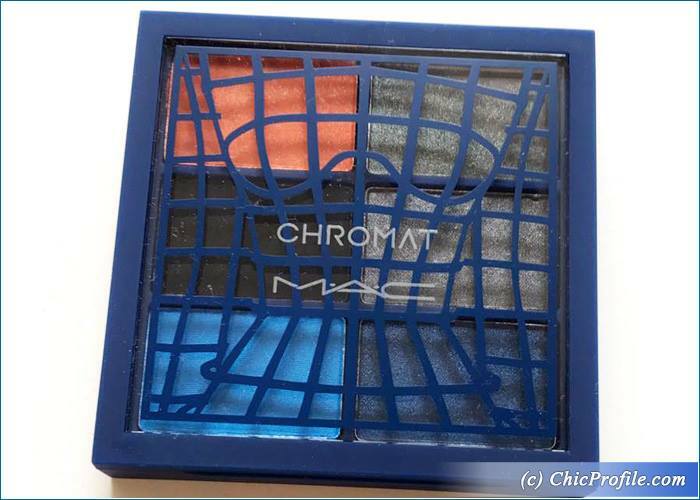 I got the new MAC Chromat Eyeshadow Palette as a sample about two weeks ago so it’s time for a review. 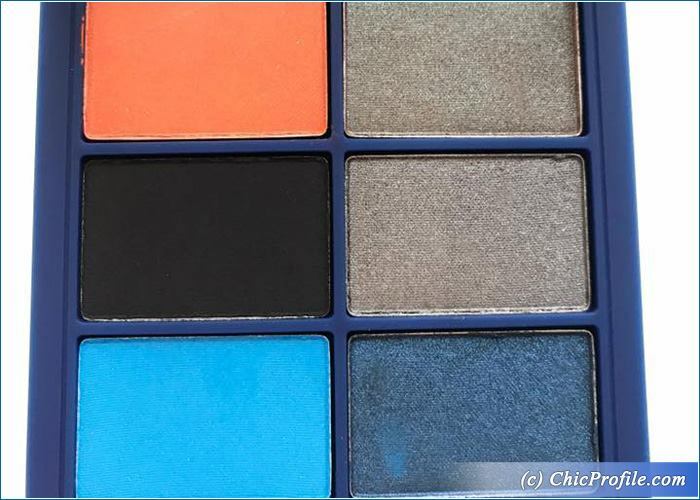 MAC Chromat Eyeshadow Palette hosts six eyeshadows and is part of MAC Chromat Summer 2017 Collection. The special packaging with an architecturally inspired bionic 3D print in blue makes this palette a limited edition release. 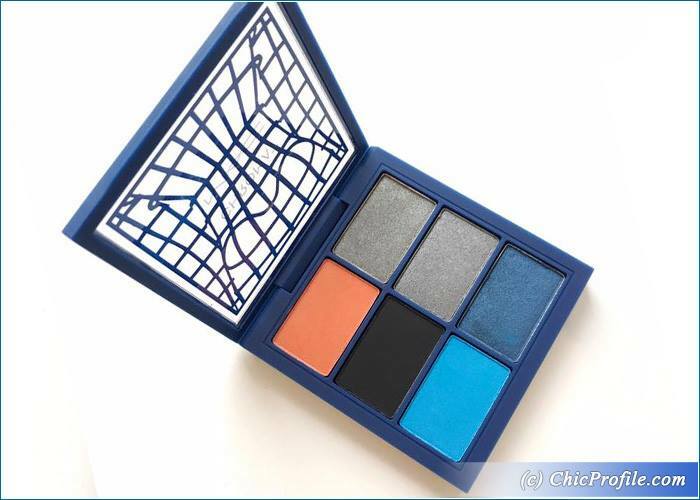 The shades are mostly dark with a pop of orange and blue and range in finishes between satin, frost and matte. I admit that the color combination didn’t appeal to me at first and I bet that if you don’t like blue and orange shades you’ll feel the same. I was still interested in the black and grey shades and a bit curious about the dark blue so keep on reading for my full review. 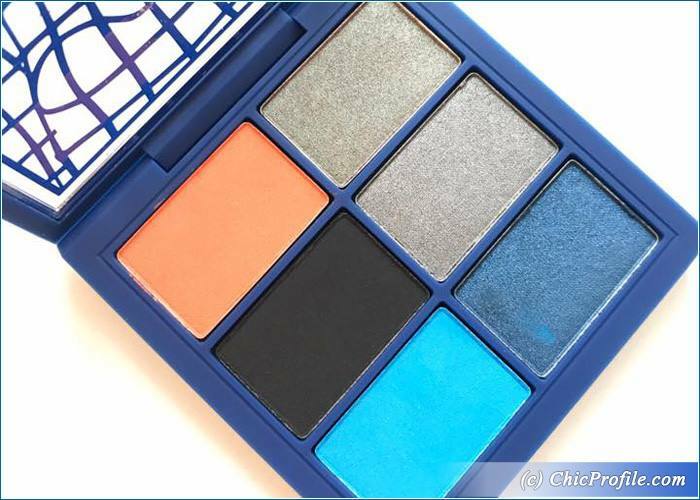 MAC Chromat Palette ($32.00 / £25.00 / €42.00 for 0.19 oz. 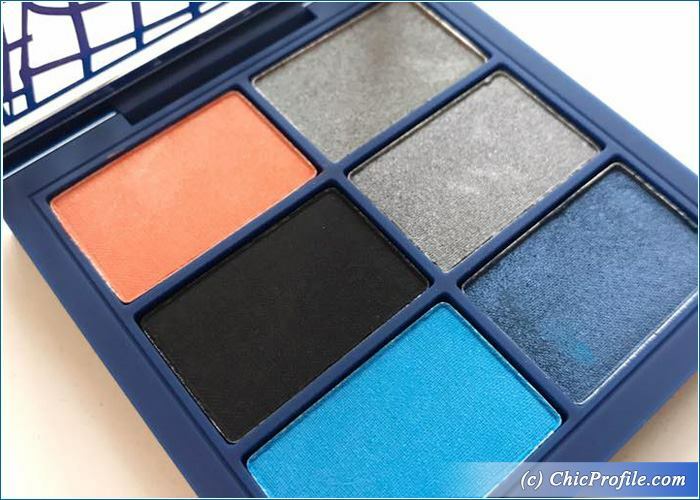 / 5.6 g) includes six shades of rich black, pearlescent deep orange, brown with blue/green pearl, vibrant ocean blue, pearlescent navy and metallic gunmetal. 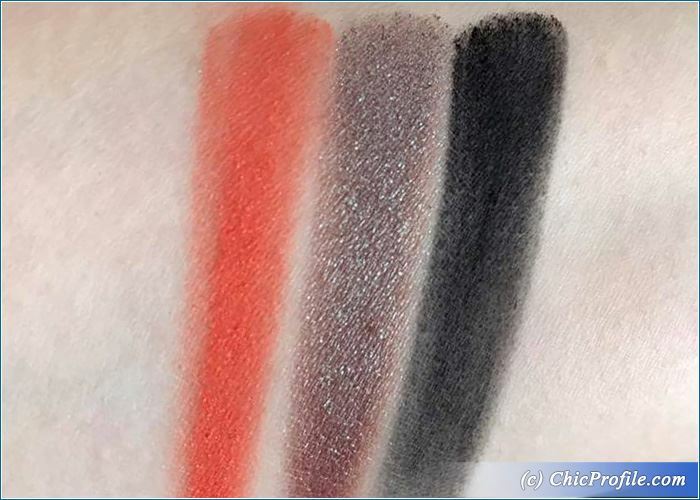 The shades are described as highly pigmented, easily blendable and delivering even application. 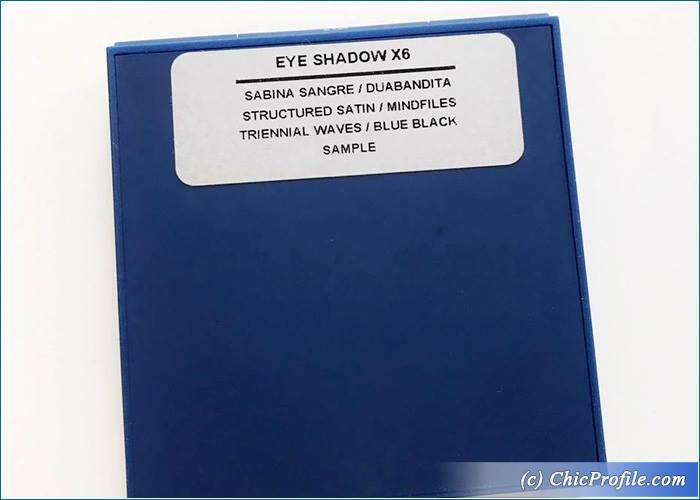 Sabina Sangre Eyeshadow is a bright orange with subtle gold sparkle an a matte finish. I got a semi-opaque color when I first swatch it. It’s easily buildable to full coverage in two layers. The application went smoothly, the color adhered well on the skin and was easily blendable. I had no fall out during the application. The consistency it was smooth and soft without feeling powdery or dry. If you enjoy a pop or orange color you should definitely check out this shade. I had around eight our wear with this formula. Duabandita Eyeshadow was the surprise color from this palette. On a first look it was so similar to Mindfiles that I thought why would they put these shades in the same palette. Only when I swatch it I saw the difference. It’s a medium plumy-brown with a blue and green pearl and a frosted finish. It has a duochrome shift that makes this color not only beautiful but interesting and unique as well. The pigmentation was awesome, it applied well and without any fall-out. It adheres well onto the skin and is easily blendable. The consistency feels so soft and smooth to the touch, just a pleasure to swatch it. I had about eight hours wear with this color. Structured Satin Eyeshadow was suppose to be a rich black but is more like a medium-black with matte finish. I expected more pigmentation and opacity out of this one. I managed to built up the color to a full coverage in two or three layers. The consistency was a bit disappointed as it felt a bit dry. It wore for eight hours on me. Mindfiles Eyeshadow is a medium gray with a silver, metallic sheen. It had semi-opaque color coverage with a soft formula. It blended easily, without any fall-out during the application. On bare skin it has a pretty good adherence and the color applies evenly. I got the same eight hours wear with this formula as well. Triennial Wave Eyeshadow was tricky right from the start. 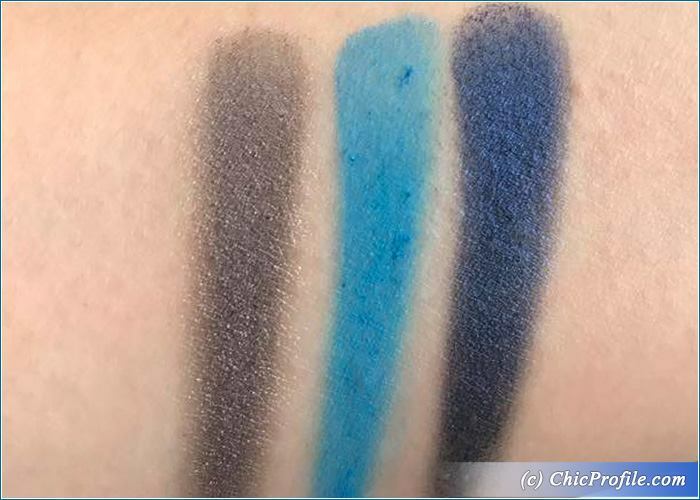 I’m not keen on blue eyeshadows as is fairly difficult to find a good matte one. This one is more of a light-medium aqua-blue with subtle silver sparkle and matte finish. It had semi-opaque color coverage. The consistency felt dry and kick off a lot of excess in the pan and when I swatch it. It felt powdery in some way and even though was blendable, I had some fall out during the application. This was the only shade that disappointed me but since blue is not among my favorites, I can’t say I’m that affected. I got almost six hours wear before the color started to fade. Blue Black Eyeshadow is a dark, navy blue on a black base with blue pearl. The pigmentation was good, almost full coverage in one swipe. It applies easily and evenly across the lid. The consistency was smooth and silky so it was very easy to work with and blend. I had no fall out during the application and I absolutely like the satin finish. This was the second eyeshadow color that surprised me, after Duabandita. I really didn’t have any high hopes for this shade but it turned out incredibly well. Because it’s such a dark blue, I become to like it and I prefer mixing it with the black matte color. It was a long-lasting formula up to the point of eight hours wear. MAC’s eyeshadows are always a few hits and lots of misses.